A few years ago, I planted one lonely thornless blackberry twig in my backyard. I nursed it and took care of it. But then I ran over it with a lawnmower….then I nursed it again. And now, I have 20 feet of blackberry bushes lining one full side of my backyard fence. It is a race between me, the squirrels, and the birds to see who can nab the blackberries first. There may have been a time or two that I have stood in my backyard, gorging myself on these fresh thumb-sized blackberries. I’m too excited about the harvest and will eat so many that there isn’t any left to bring inside! I stare at my purple soaked fingers and sort of feel bad that I haven’t shared any with my husband… so naturally I have to lie and tell him that the birds got them… ALL. yes.. All of them. right out of my hands. It was a tragedy. Crying, Thrashing. Feathers everywhere. I promise I tried. They were ferocious….. But my purple lips and seeded teeth tell the real truth. 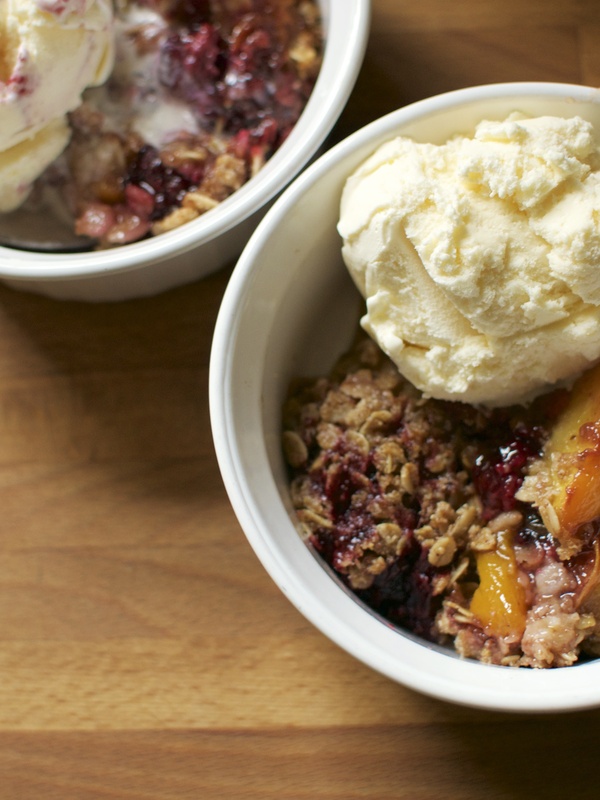 This recipe is my standard crumble topping. I use it on tons of different fruit crumbles. I added some lemon zest to the crumble to give it a light summery zip. 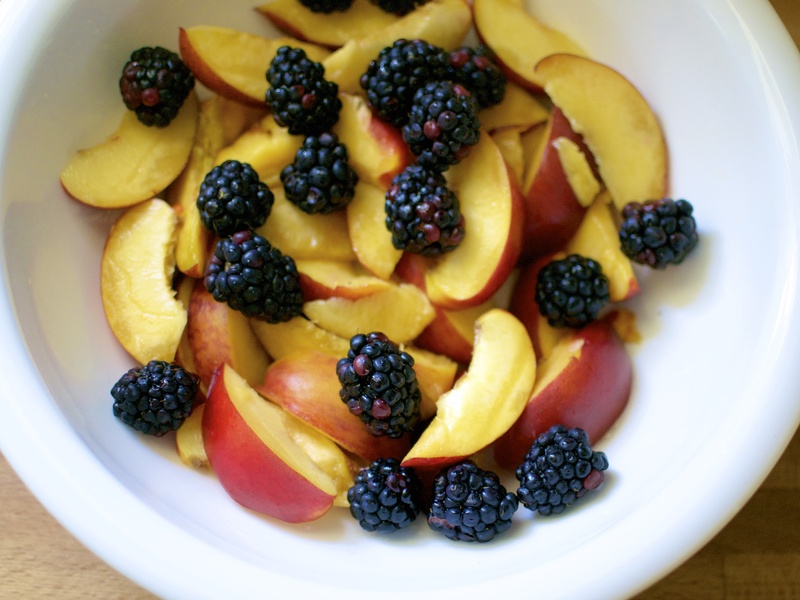 You could easily swap out the fruit in this filling with peaches, raspberries, blueberries, etc. It is really easy to throw together for summer gatherings to use up all that fresh fruit produce that is flooding the markets. So give yourself and the ones you love a warm and awesome summer treat! Preheat oven to 350F. Butter a 9-inch cast iron skillet or 8X8-inch baking dish and set aside. In a medium bowl, mix all of the fruit filling ingredients. Spoon the fruit filling into the prepared skillet or baking dish. In a medium bowl, stir together the topping ingredients. Mix the ingredients until it is crumbly and moistened. 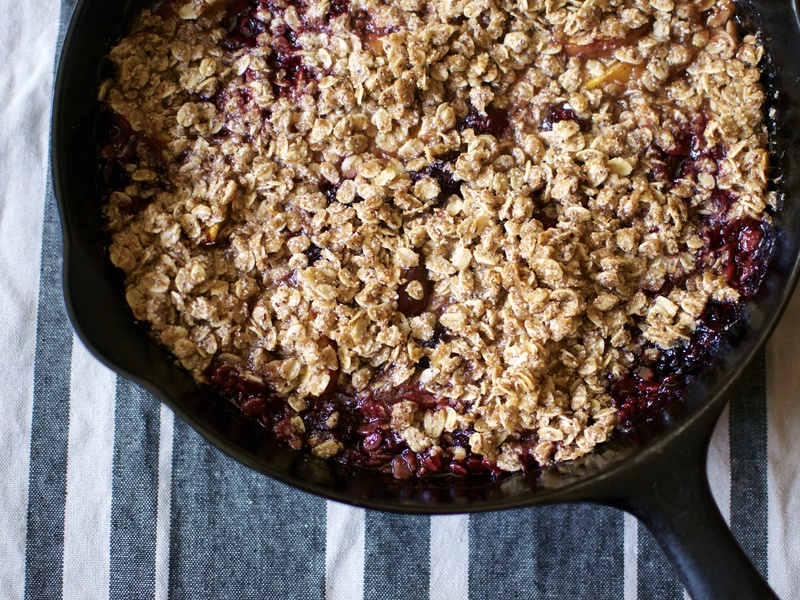 Lightly sprinkle the oat crumble mixture over the fruit filling evenly. Bake for 40 to 50 minutes (or until the filling is bubbling and the crumble top is lightly golden brown). Remove the crumble from the oven and allow to cool for 5 to 10 minutes before serving. 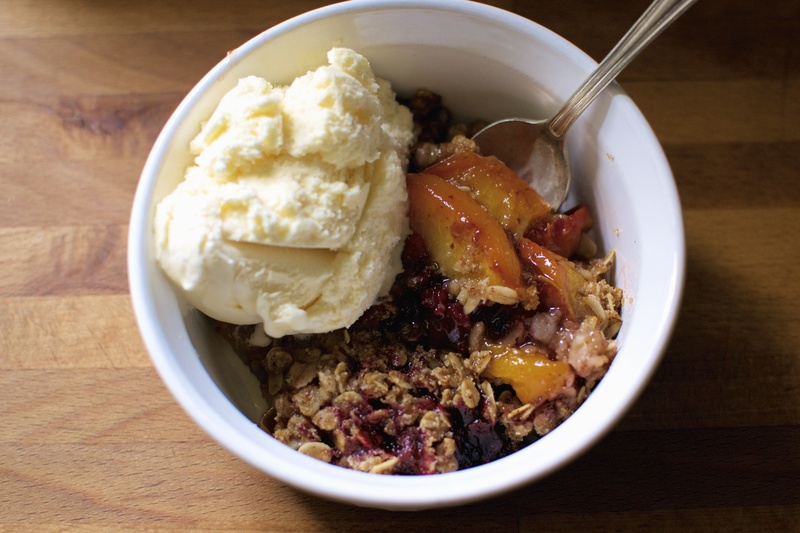 This is delicious with vanilla ice cream for dessert or plain greek yogurt for breakfast!